I can not keep my eyes off of these illustrations. For a school assignment we have to do something with illustrators, when I went searching up some, I found these amazing pieces from Karina Eibatova. Looking upon her website/online portfolio there are a lot more illustrations so if you fall for these (just like I did) certainly take a look there for more! The way she uses the watercolor paint is amazing, I love the colors she uses and how they are combined. 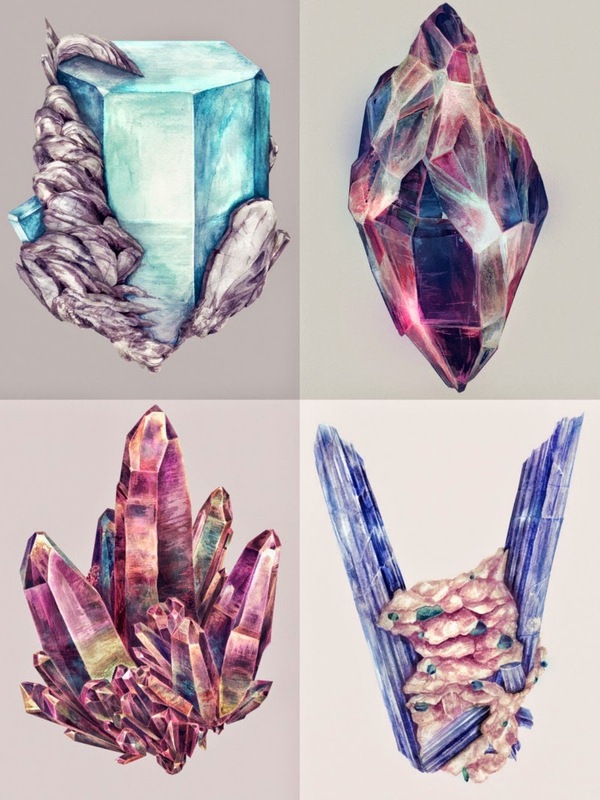 The stones truly shine and they are very dreamy and maybe even seem like magic. She sais her inspiration comes from nature: landscapes, the universe and essential things like these stones. I feel like these colours and this style are close to me. Thereby she makes something very new out of 'existing' stones. Right now I would love to try watercolor too and make things like these! What do you think of her work?